Provisional results are showing that Tonbridge finished third of the division one teams. These have yet to be ratified and as there is just half a point in it, some further checks are being made. TAC had five in the 1500s and six in the 3000s, as seven pbs, a seasons best and two club records fell. The records came from Ashley Gibson with 3000 in 9.24.82 to break her own senior women's mark and Graeme Saker who ran a well judged race to take the over 55 time down to 9.51.61. 1500 - Dan Seagrove (u20) 4.04.45 pb, Michael Ellis (sm) 4.05.43 pb, Fraser Gordon (u15) 4.11.69 pb, Katie Goodge (u15) 4.50.89, Holly Gordon (u20) 5.25.51 pb. Fraser's time is one of the fastest ever TAC under 15 mark's and compares well with George Duggan's club age record of 4.08.46. 3000 - Alasdair Kinloch 8.21.37 sb, Miles Weatherseed (sm) 8.25.18 pb, James Puxty (u20) 8.30.28 pb, Jamie Goodge (u20) 8.39.11 pb. Six TAC athletes competed at Brighton in the BMC 800s and 1500s. Sean Molloy led the way with a 1.48.66 for 800 metres, which was his second fastest ever time, after the 1.48.24 that he ran in 2012. This is not that far away from Steve Fennell's club record of 1.47.97. The race was won by Kyle Langford in 1.47.57, with European Bronze Medalist and Olympian, Elliot Giles in second. Video below courtesy of Carla Randall. ​Simon Coppard won race C in 1.57.74 in his first race of the season. Charlie Crick improved his recent pb to 1.58.79 and Isaac Harding dipped under two minutes for the first time with 1.59.37. Peter Bannister was the sole 1500m runner and ran a new pb of 4.39.93, as he continues his swap from international kayaking. Charlie becomes the 13th TAC runner to break four minutes this year. Each of the last three years were have had fifteen. 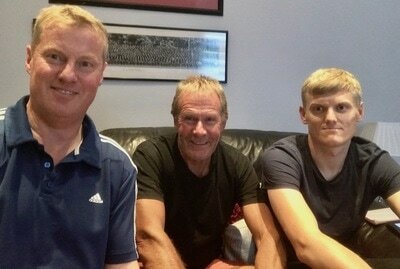 Trackside Podcast, Episode 15 - Live ! 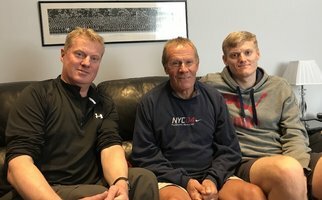 Episode 15 has gone live this week. TAC took up a dozen club places for the London 10k. ​Results summary on the Results 2017 page. TAC finished fourth of the six clubs. Full results and a summary are on the Results 2017 page. ​Summary on the Results 2017 page. Photos courtesyof Gary Goodge. What was supposed to be a warm, sunny and still evening wasn't as a chilly wind crossed the stadium. Phoebe would need to run 16.30 to gain the European qualifying standard and automatic selection. Her time was also a TAC under 20 record. ​Summary on the Results 2017 page. There were two what they call quarter finals, as the National Champs have the semis and final. Robbie was in race two and knew that the top seven would qualify, provided that the pace was reasonable. So it was just a case of doing enough to qualify. In what were probably the best conditions of the season so far, there were some very encouraging TAC performances. Sean Molloy had his first race of the season and won the 800 metres A race in 1.50.53. This sent Sean straight to the top of the TAC club rankings. In race B Kieran Eland lowered his pb to 1.56.22, taking a tenth of a second from his previous best. In race C Dan Seagrove (u20) ran 1.56.67 and Christian Lee (u20) 1.58.87, both improving their pbs by a second. The only TAC 1500m athlete was Lizzie Miller (u17), who lowered her seasons best to 4.51.76. 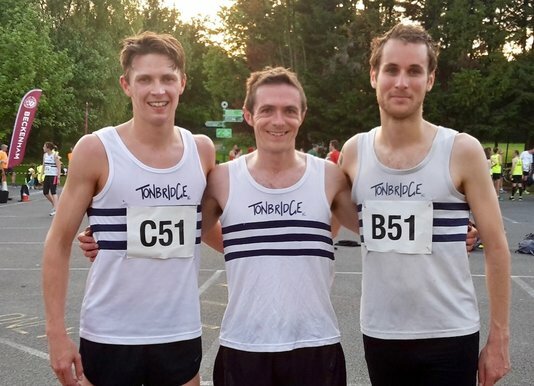 The Tonbridge men's team of Tom Cox, Julian Rendall, Dan Bradley defended the club's title from last year. TAC won the match and amongst the results there were wins for Kieran Eland (400m), Jamie Brown and Lizzie Miller (800m) and Bede Pitcairn-Knowles (3000m steeplechase). 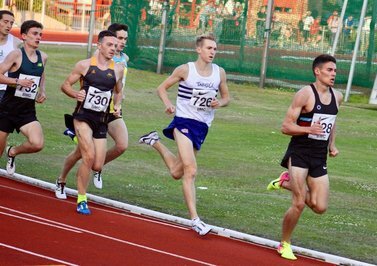 Three TAC distance runners were in action, with Kieran Reilly lowering his seasons best to 3.51.97 in the 'Guest' 1500 metres. 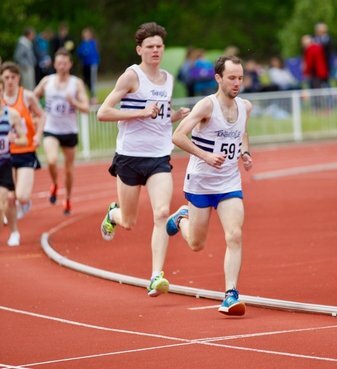 George Duggan was disappointed with his 3000m in 8.24.45, but it was still a 22 second pb, whilst James West also had a frustrating race, being caught in the home straight of the Match 1500m, having front run the second half, to chase the European under 23 qualifying standard. James was 4th in 3.44.32. Tonbridge AC finished 2nd of the six teams, which was a real improvement on 4th in the first match. In the distance races perhaps the under 13, 1200 metres win by Olivia Breed stood out, as her 3.53.8 is one of the fastest TAC times ever recorded. Katie Burgess and Katie Goodge, combined with sprinters Eliz O'Donnell and Maisie Rixon to win the 4x300m in 3.01.9, which was just outside the TAC under 15 club record. 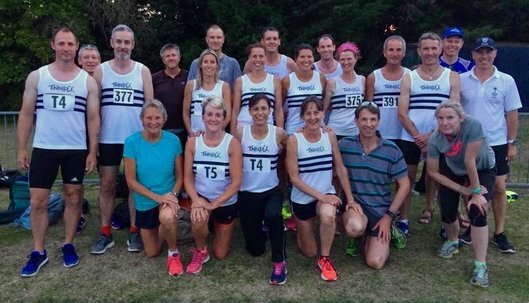 There is live action this weekend from two big events, featuring Tonbridge AC athletes. 2.32 pm Joe Fuggle 400 Hurdles, 3.18pm 3000m George Duggan, 5.10pm 1500m Guest race Kieran Reilly, 5.22pm 1500m Match Race James West. Plus Zak Skinner I think in the 100m at 3pm. Three TAC distance runners have qualified for this year's Regional Championships, in the USA. The US College system involves the top 48 athletes per event, from each region (West and East) contesting the Regional Championships. This is based on performance rankings, from the season so far. Both championships take place next weekend, from Thursday 25th May and include heats and 'finals'. Then the 'top 12' (like qualifying through heats) from each region qualify for the National Collegiate (NCAA) Championships at Eugene, Oregon, two weeks later. 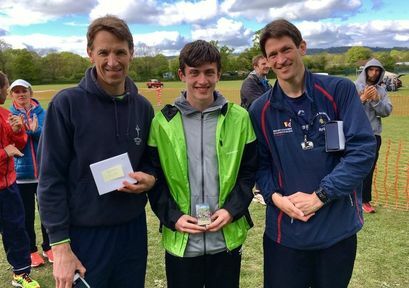 ​Henry Pearce was very unlucky not to make the West Region 10,000 metres as his 29.41 was just two seconds away from the top 48 listing, even though he won the race, in which he ran his best time. There is a new update from Mark Pitcairn-Knowles on the Masters/Veterans page. The TAC veterans team train rolls on as the performances get stronger. On this occasion, the second match in the top division, the men were second and the women first. Mark Pitcairn-Knowles and the team have built enthusiasm both for training and competition, with regular specialised coaching to help some with unfamiliar events. The competition is for over 35s, upto anything ! ​Amongst the Monday night performances were club records for Lucy Pitcairn-Knowles (w50 5.50.4 for 1500m). 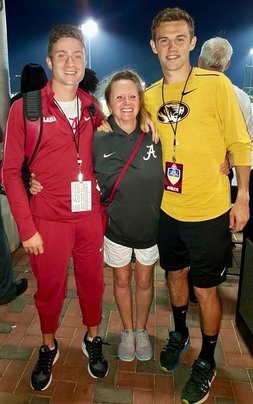 Although not distance running Pete Brenchley (coach) set a TAC m70 Discus record of 17.47m, which is almost a four metre improvement on last year. The full results are on the Results 2017 page. Chris Olley finished a close up 5th over 3000 metres, in Germany, as he opened his season with 8.08.38. 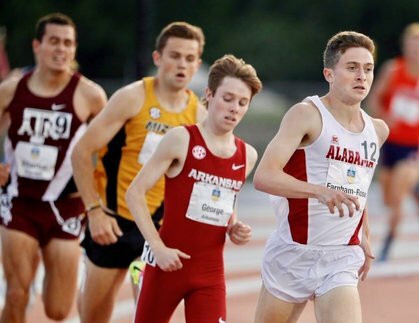 ​Henry Pearce followed up his 10,000m win on Friday with third place in the 5000m at the South East Conference, South Carolina. He ran 14.32.66 in what was a team effort for Tulsa, as they filled the first four places. In San Francisco, Ryan Driscoll finished 2nd over 1500 metres in 3.49.57. 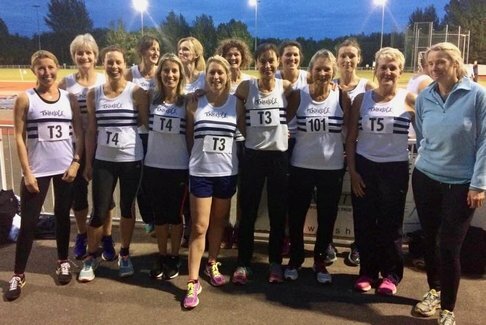 There were four Tonbridge AC runners in action at the championships, racing for Kent. Max Nicholls finished an excellent 3rd, Jamie Bryant 23rd, Greg Cole 44th and Euan Nicholls 54th. 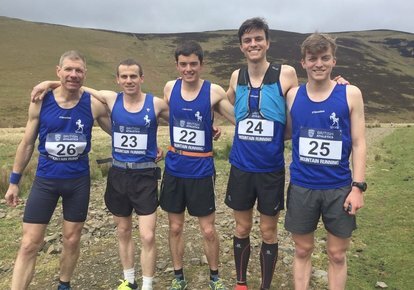 Greg Cole (23), Jamie Bryant (22), Max Nicholls (24), Euan Nicholls (25) - most of the Kent Fell Running Team ! 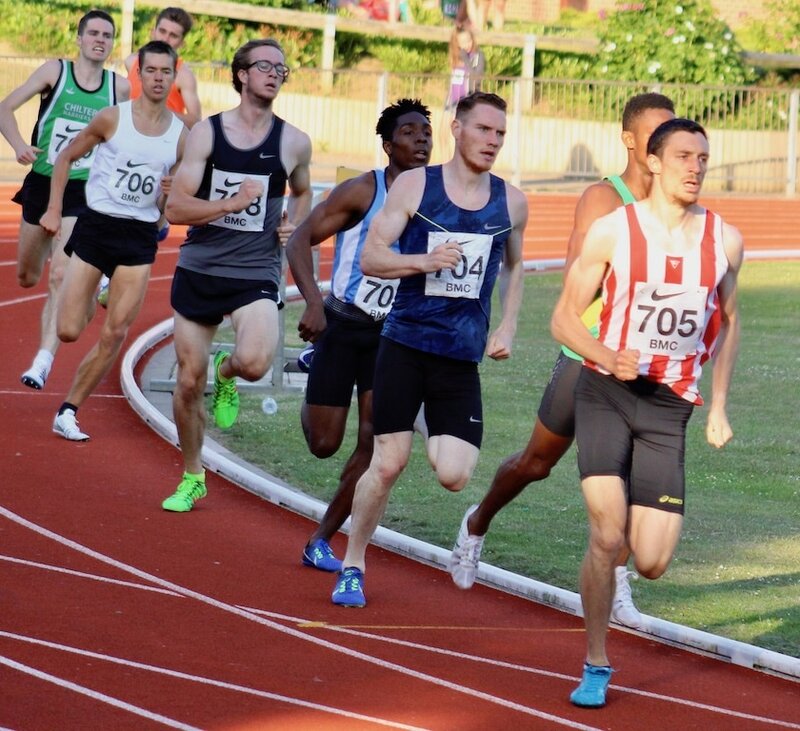 South East Conference, South Carolina, Mens 1500 metres - Robbie Farnham-Rose (3.47.76) and Luca Russo (3.47.81) were in the same heat and finished 2nd and 3rd, which were automatic qualifying places for Saturday's final. American Athletic Conference, Houston, Mens 10,000 metres - Henry Pearce won the Conference title in 31.21.90 He will also contest Sunday's 5000 metres. Loughborough - 800m Kieran Reilly 1.56.85, 3000m Chloe Bird 10.32.09 pb, Kiri Marsh 10.39.08 pb, Lottie Richardson (TAC trials) 11.28.41 debut. Crystal Palace - 400m/800m Peter Bannister 62.06/2.18.22 debuts. 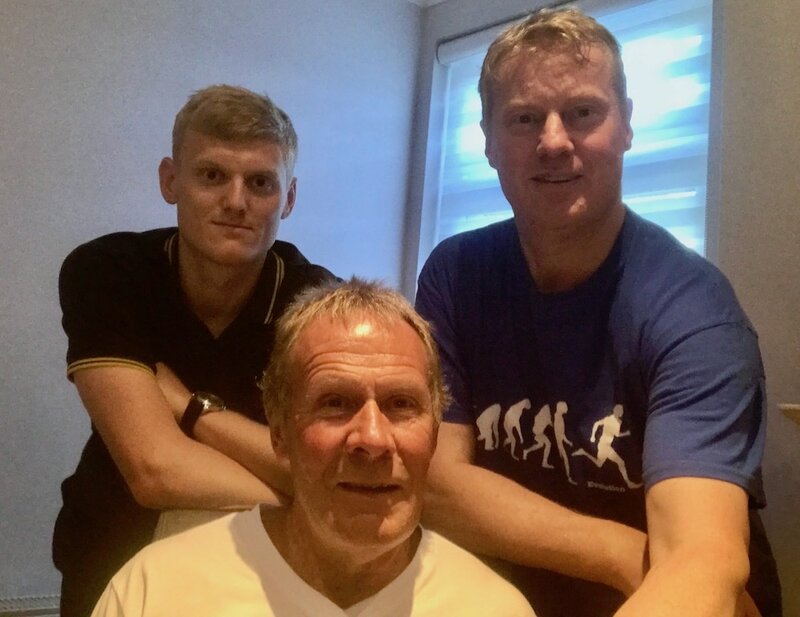 Trackside Podcast, Episode 14 - Live ! Episode 14 has gone live this week and showing the best listening figures yet, plus creating some good feedback and ideas. Here are a few of the athletes who made big improvements on their personal bests, over the last few days. James Puxty finished second in the Darent Valley 10k road race in 35.07. TAC had probably the largest squad for some time in the Kent Young Athletes League, with a division 1 and division 2 teams, plus non scorers. The effort was swelled by Judd School providing a combined effort in division 2, as TAC finished a close second to Blackheath in both leagues. It was good to see a number of young distance runners making their debuts at the specific events of 1200m and 1500m, with some significant personal bests being recorded. See the summary with the results. Fraser Gordon provided the only A-string win in division 1 with a 1500m pb of 4.19.4. 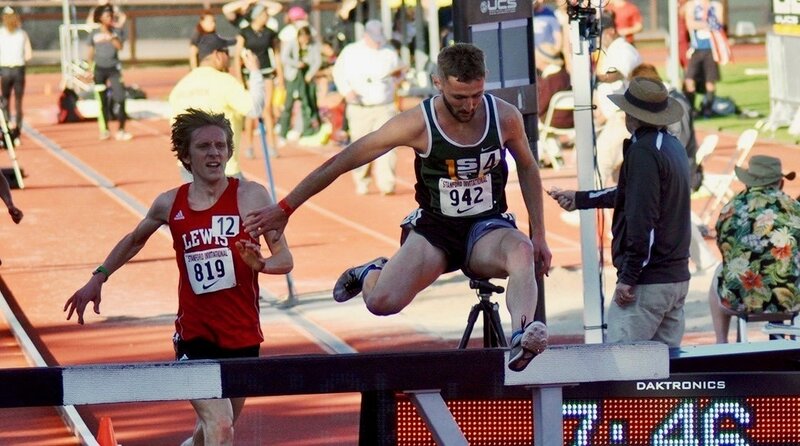 After four previous sub nine clockings Ryan Driscoll broke Stuart Kirk's Tonbridge AC 3000 metres steeplechase record last night with 8.50.87, in California. Ryan is one of the most popular lads at the club and it's fitting that he takes Stuart's record, as he was similarly thought of. 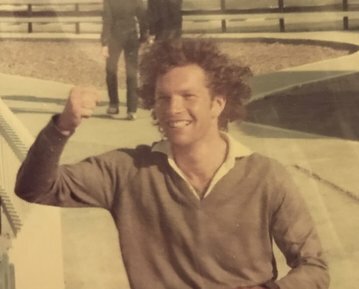 The record lasted 34 years and what a great testament to Stuart, who was tragically killed in a car accident back in the 80s, whilst at Northern Arizona University. 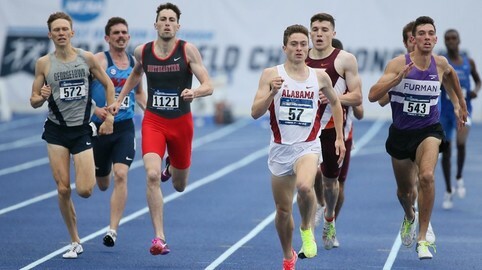 Chris Olley won a low 1500 metres in Germany in 3.54.6, to open his season, with his first race since the National Cross Country Championships. Megan Brickell made a terrific breakthrough at the Stratford Parkrun near Manchester to record 18.18, as she continued to return from long term injury issues. Here are a few of the athletes who made big improvements on their personal bests, over the last week. Its been a busy week or so. Mark Pitcairn-Knowles has written a Masters/Veterans news update which is available on the Masters page. 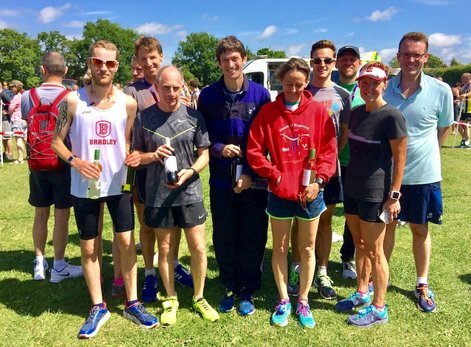 There were six personal bests, a BMC A race win and two club records, all coming from nine of the eleven TAC athletes competing.This was despite the cold and damp conditions. Ashley Gibson broke the TAC womens 3000m record, previously held by Grace Nicholls, with 9.32.09, whilst Graeme Saker lowered the M55 record to 10.01.21. 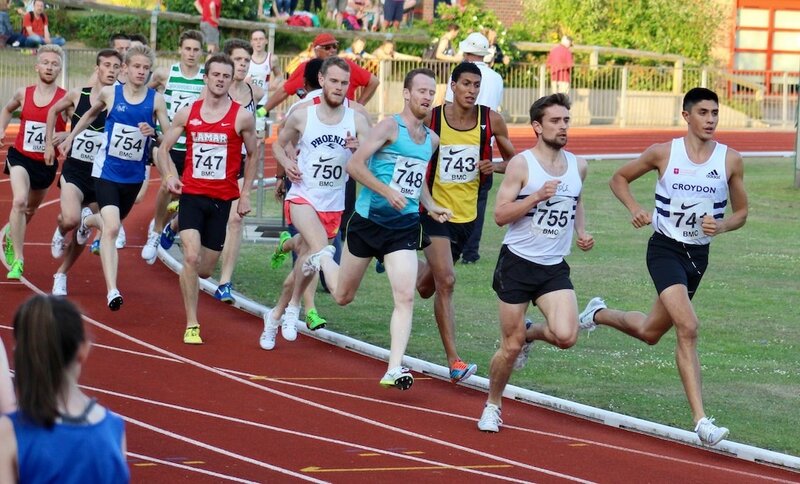 James West opened his season with a win in the BMC mens A race 1500m in 3.49.64. There were 3000m pbs for Corey De'Ath (8.21.55), James Puxty (8.41.97) and Bede Pitcairn Knowles (8.51.14), plus a 1500m bests for Ally Kinloch (3.54.00), Christian Lee (4.14.56) and Phoebe Barker (4.29.39). There were five 800m races and three mile races amongst the events. ​Videos of all the mile races and the fastest two 800m races have been provided by Gary Goodge. By my calculations every TAC distance runner who competed on Monday at the BUCS Championships ran a personal best ! 5000m Women A race - 5th Nicole Taylor 16.25.21 (6th overall on time) - TAC Club Record ! 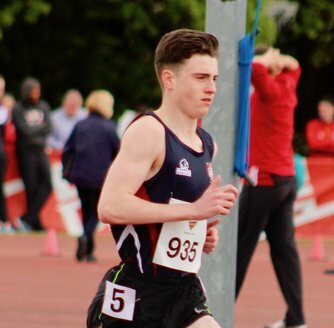 Charlie Joslin-Allen finished an excellent 5th in the Welsh 5km road championships in 14.49. Lucy Reid was first female home in the Clapham Common 10km road race in 36.31. This was 22 seconds inside her pb from 2014. Greg Cole won the Shinfield 10km in 33.47, which was just one second away from his personal best. TAC dominated the top spots. 10M Male Dan Bradley 2nd after a fall. 5M Men 1st Fraser Gordon, 2nd Mark PK, 3rd Tony Bennett 1st M50 award for Richard Puxty, 1st M60 Brian Buckwell. Full results now on the Results 2017 page. TAC were 4th of the six teams. Provisional results are on the Results 2017 page. There were just two TAC distance runners in action. Ben Murphy surpassed all expectations to qualify for the 800m final with 1.53.68 (equals pb) and George Duggan made the 1500m final with a 3.52.08. Both finals are on Monday. George Duggan (1500m) and Ben Murphy (800m) qualified for Sunday's semi finals, whilst Michael Ellis qualified for the 3000m steeplechase final on Monday.